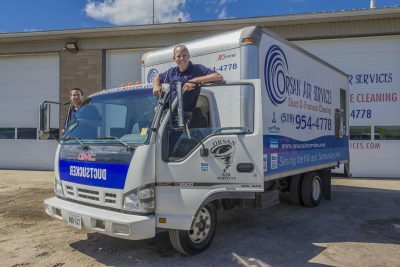 Orsan Air Services specializes in professional residential and commercial air duct cleaning, furnace cleaning, dryer vent cleaning and A/C cleaning for the Kitchener, Waterloo and Cambridge areas of Ontario. Orsan Air Services is a proud member of NADCA: The HVAC Inspection, Cleaning and Restoration Association, otherwise known as the National Air Duct Cleaners Association. Having your air duct system cleaned by our professional duct cleaning technicians can save you money on your monthly energy bills and also greatly improve the quality of the air in your home or workplace. Did you know that 1 out of 10 residential fires are caused by the clothes dryer? Improperly routed and/or clogged dryer venting can cause extreme heat and potentially a fire. Contact us now and see how we can help you!.. We have been providing duct cleaning & Furnace/AC cleaning services to St Clements, Ontario for many years! Our efficient, up to date equipment will leave your ducts clean, preventing dust and debris from re-circulating throughout your business or home. Repeat this cleaning every 3-5 years to keep your HVAC system clean and efficient. Don’t delay! We can make the air in you home clean and safe for you and your family. Rated Best Duct Cleaning Company in South Western Ontario For 4 Years In a Row!